What??! So here's my dream: To learn all about fishing in Australia and get paid to go to Australia and fish there. I've been watching videos of "Barra Fishing" and I can definitely say I am ready for this. These videos look particularly fascinating. Check out the videos to the left. I've been looking at many videos of fishing in Australia and for some reason I've had a hard time finding good videos until I started looking for Barra fishing. This fish looks amazing to catch. In fact I'm wondering if I could use my topwater lures to catch them like I do bass here in Texas. The body shape looks an awful lot like a Nile Perch and even the lures are similar. After doing a little research I found out that Nile Perch and Barramundi are nearly identical. There's even some debate as to which tastes better. Regardless, it sounds like Barra are a blast to catch. They look like a mix between Red Drum and Largmouth Bass and they go for similar lures with Barra also going for live/dead shrimp. The point is, I want to catch some of these things so I can document catching them in video and in writing about them. I just need someone to give me the chance! That said, I would love to hear from my Australian readers as to what the best sport fish is in Australia. I watched a video recently of a TV show from down under called Fish&Hunt Australia and it was about squidding and catching some small saltwater fish as well as catching some slightly interesting deep dwellers that are all supposed to be good for eating. While this is all fine and good for those that are out to catch their dinner, I'd like to do more than just put food on the table. I want to know about the game fish of Australia. Both inland and in saltwater. I know that Australia has trout in her mountains... undoubtedly planted by the British. But there's got to be more than that too - like the Barra - and I can almost guarantee you that kayak fishing for these fish would be a blast. But I don't see much about it... Can it be that kayak fishing is still new to Aussies? So let's hear it from down under! Give me some pointers because one of these days I'm going to visit Australia and I'll be wanting to go to the best spots. I don't want to have to guess at where the best fish are and what to use on them! Finally, I want to build rods for Aussies. My brother is in Australia and he's been doing some research in the rod department but he's not much of an angler so he's not sure what to tell me. 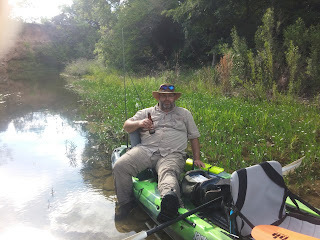 I need advice from a local angler and I'm hoping one of them will read this blog someday and give me goods on it.